- Publisher Following the outline of Proverbs 31, Lane Jordan provides women of all ages with hundreds of time-saving tips and biblical advice on how to organize, manage, and balance their life and family roles. - Includes practical hints on household and family management, plus tips on reaching out to the needy in the church and community, and developing a rich spiritual life. - Discussion questions follow each chapter for group or individual use. - An excellent resource for a Bible study or small group. 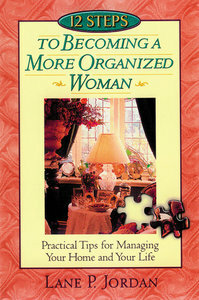 About "12 Steps to Becoming a More Organised Woman"
Following the outline of Proverbs 31, Lane Jordan provides women of all ages with hundreds of time-saving tips and biblical advice on how to organize, manage, and balance their life and family roles. Lane P. Jordan is an author, recording vocalist, speaker and seminar leader, and is involved with the Stonecroft Ministry for Women. She is the former associate producer for Charles Stanley's "In Touch" program. She lives in Littleton, Colorado with her husband and two daughters, where the family is actively involved in their church.